We had a large turnout for our first meeting of 2011. It looks like a lot of folks are anxious to get out and start gardening this year! We want to thank George Malette, master gardener, who gave an inspiring presentation on Edible Landscaping and Victory Gardens. A Victory Garden is a vegetable garden, especially a home garden, cultivated to increase food production during a war or period of shortages. 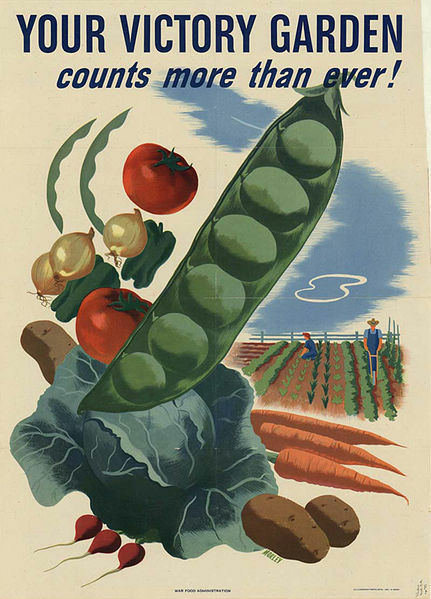 In WWII, Victory Gardens produced up to 40% of the vegetable produce being consumed nationally. During these tough economic times, more people than ever are planting vegetable gardens in urban areas and growing their own food. You can’t get more local than your own back yard! That is what the Capital City Organic Gardeners are all about…encouraging everyone to grow some of their own food for health and sustainability. George spent a fair amount of time talking about season extension for vegetables. 1. In the late fall, before the ground freezes, he amends his soil. 2. Next, to protect the ground from freezing, he lays down black/brown plastic. 3. Then, he piles on 18″ of leaves. 4. Finally, he puts in sturdy hoops made from gray electric conduit and lays clear plastic tarps over the hoops to create a low tunnel hoop house. The hoop tunnel is all set for the winter. 1. 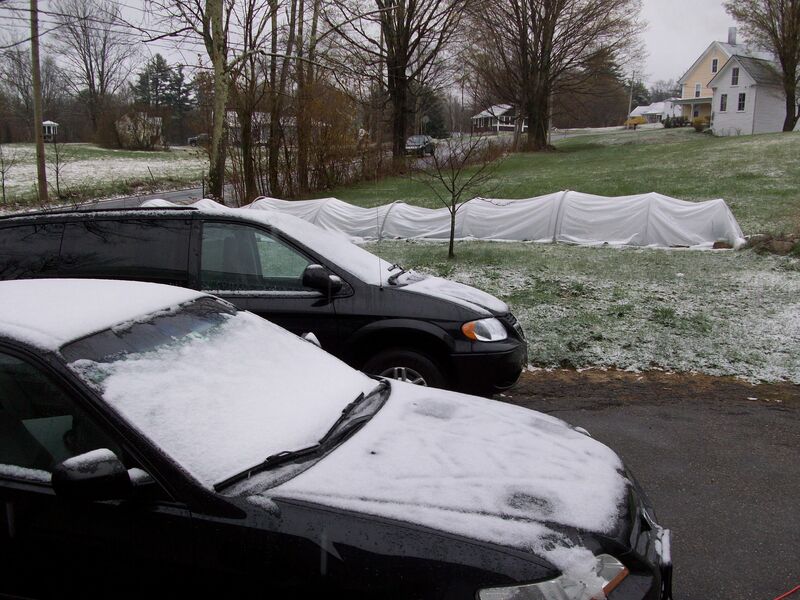 He pulls off the clear plastic tarp. 2. Removes the leaves by dragging the leaves on top of the black/brown plastic over to the compost pile. 3. He replaces the black/brown plastic on the soil and the clear plastic over the hoops. 4. Using a soil thermometer, he waits until the temperature registers 50 degrees. Once the soil is 50 degrees, he can plant! 1. He rolls up the clear plastic so he can reach inside the tunnels. 2. He removes the black/brown plastic. Plants his vegetables. Cold weather veggies can be planted at 50 degrees. He waits until the soil heats up to 60 degrees to plant hot weather vegetables like tomatoes and peppers. 3. Then he places clear plastic water jugs filled with water in between his plants/planting areas. The water in the jugs moderates the temperature inside the tunnels so that it doesn’t get too hot or too cold. 4. On a really nice day, he ties up the sides of the tunnels but makes sure to put them down at night so that nothing freezes. 1. He removes the clear plastic and lets the garden thrive. He is able to harvest veggies four weeks earlier than most folks! 1. He replaces the clear plastic and milk jugs. This allows him to continue to harvest vegetables up to Thanksgiving. George has harvested tomatoes well into November. Imagine that! 2. Before the first snowfall, he amends his soil, puts back the black/brown plastic, piles on his leaves and replaces the clear plastic so that everything is ready to go the next spring. Edible Landscaping was another topic of discussion. 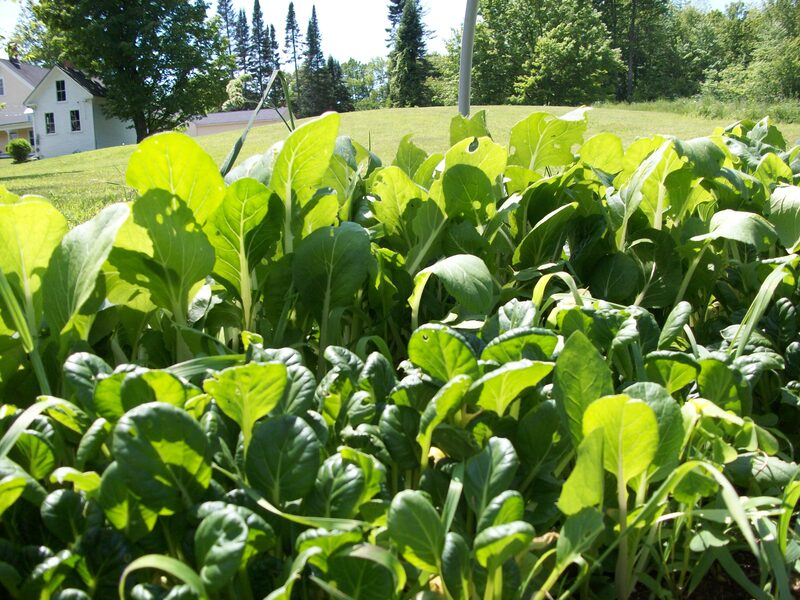 Edible Landscaping is a way of rethinking your landscaping and replacing many traditional shrubs and flowers with edible plants. So many fruits, vegetables and herbs look beautiful enough to incorporate into any landscape. • Use your imagination! So many edible plants are truly beautiful. Tuck them in and around your flowers. Our next meeting will be on Wednesday, April 20th at Grace Episcopal Church at 30 Eastman Street in Concord. 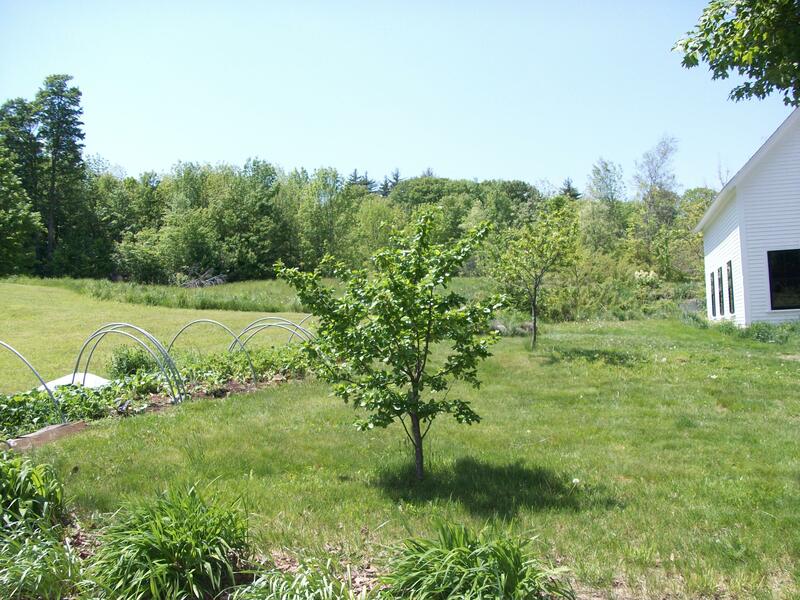 Ayn Whytemare of Found Well Farm will talk about Raised Beds. Ayn will teach us how to build a raised bed in the morning and be ready to plant in the afternoon. Join us! Check out the Calendar section for more information.